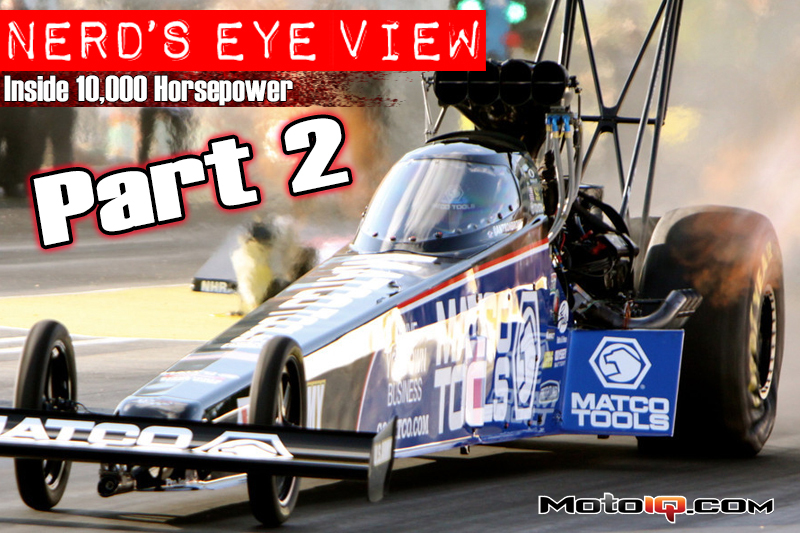 A month ago MotoIQ published an article called Nerd's Eye View—Inside 10,000 HP. In that article are facts that still scramble my kidneys. In fact, I've been talking about it ever since to friends (the fam's already fed up). What these rocket-propelled humans go through in a Top Fuel dragster is beyond my comprehension. I've watched the video at the end of the article repeatedly, and even again a few times this afternoon. The way the tires gripped as the cars roared by me left me dumbfounded every time. It just doesn't look real. The sound from this close proximity—about 15 feet—I can't over-exaggerate it and you'll just have to take my word for it. If you haven't read Part 1, strap yourself in for a ride. And if you have, it's time to get some closure to this madness. Last time, we learned how these maniacal engines make so much power. With spark plugs turning into arc welders from crazy ignition systems, they ignite 65 PSI of air and Nitromethane that's pumped at an astounding 22,000 LPH, thanks to a supercharger so big it requires the power of a Viper engine to simply turn it. In the end, they reach over 300 MPH in the time it takes a current Porsche GT3 to hit 60 MPH, while still pulling more G's at that speed than even a Bugatti Veyron does off the line. Something silly like that, only every word of it is truth. Well that's cute and all, but how do they put 10,000 horsepower to the ground? They run actual tires, right? It's this subject that really wins races, and it's here where teams spend countless hours fine-tuning for each run, because it all depends on the variable track and ambient conditions. If slipping the clutch or tires slightly too much causes the car to lose 5/100ths of a second, they can lose the race. Fact #12: The entire field of sixteen Top Fuel dragsters that qualified at the Kansas Speedway event I attended were separated by just 0.15 seconds. It actually equates to right around three full Top Fuel car lengths (or five Mitsu EVO X's). While 0.15 seconds may not sound like much, remember this is a sub-4 second race, so it's significant. Your shotgun-riding girlfriend would be asking you to let her off at the next light if someone beat you to 50mph by five car lengths. I had arrived Friday morning. With a few hours prior until its first run, the team unloaded the car. The cool thing about the “Nitro Alley” paddock is it doesn't cost any extra to walk through, and you get up close and personal with the cars, crew and many times, the drivers as well. Check out the length of the car (25 feet). With the engine in the back, the length and downforce will help prevent a wheelie. I just hope they don't roll the car too far off the truck one day (“excuse me sir….sir….heads-up!”). An intricate part of putting the power to the ground is the clutch. 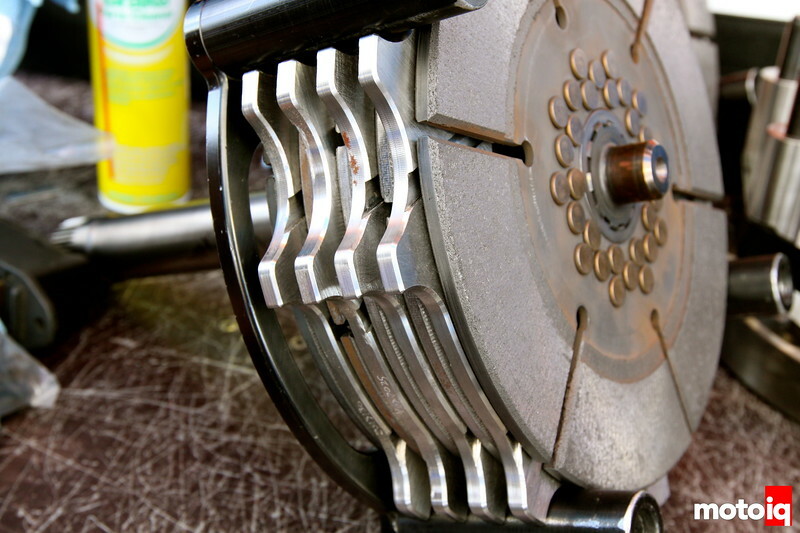 The DSR/Matco Tools Top fueler uses a 5-disc clutch. 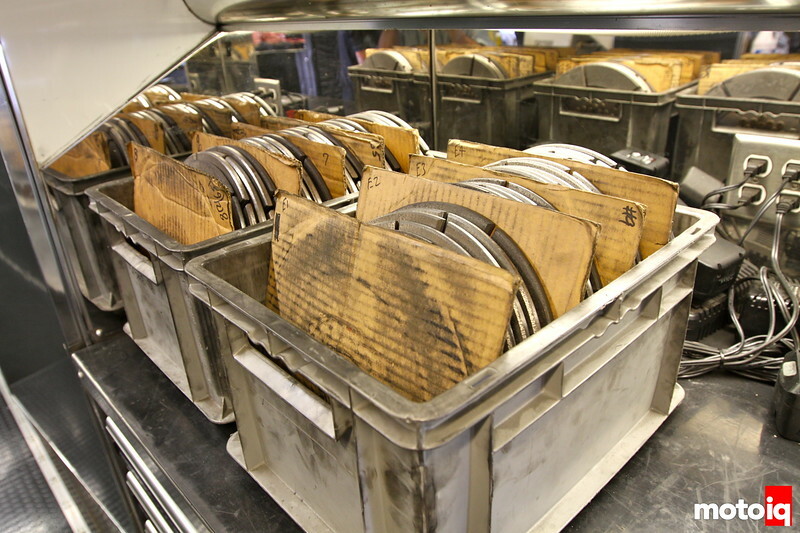 Most of the clutch assembly—all except the discs themselves—is fabricated in-house at DSR. The discs don't use any fancy material. In fact, the standard steel discs are right off of a Caterpillar bulldozer! Since the clutch goes through so much slip and, therefore, heat, all of the discs are replaced after every sub-4 second pass. They go through so much heat that in fact they're still a smoldering 500F by the time the car leaves the track, pulls into its paddock and gets the clutch removed. The team travels with several sets of discs, as pictured here. If you've ever been in Nitro Alley when a nitro car is fired up, you couldn't miss the fact that some cars will have the throttle blipped a couple of times while others simply idle. The Matco Tools team does the latter. The reason is the more the throttle is blipped the heavier glaze that is placed on the clutch disc surfaces. The heaver the glaze, the harder the clutch grabs off the line. 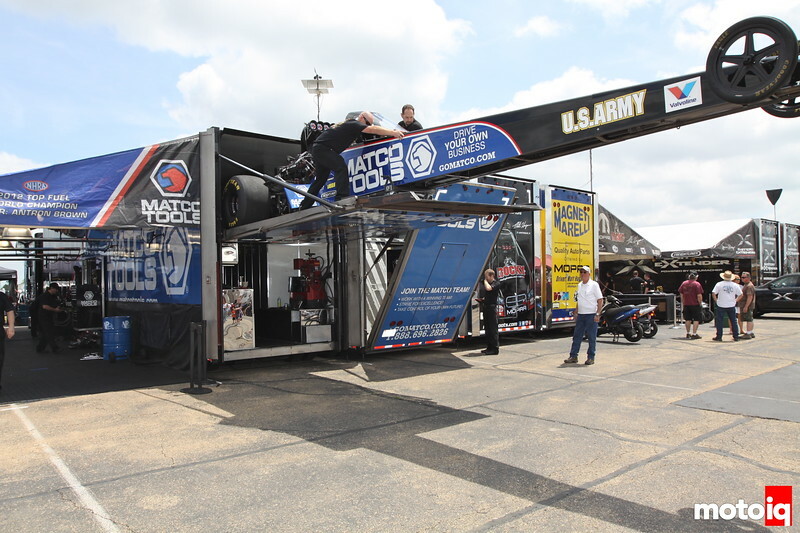 It's all a matter of preference, and Antron's team prefers a smoother launch. 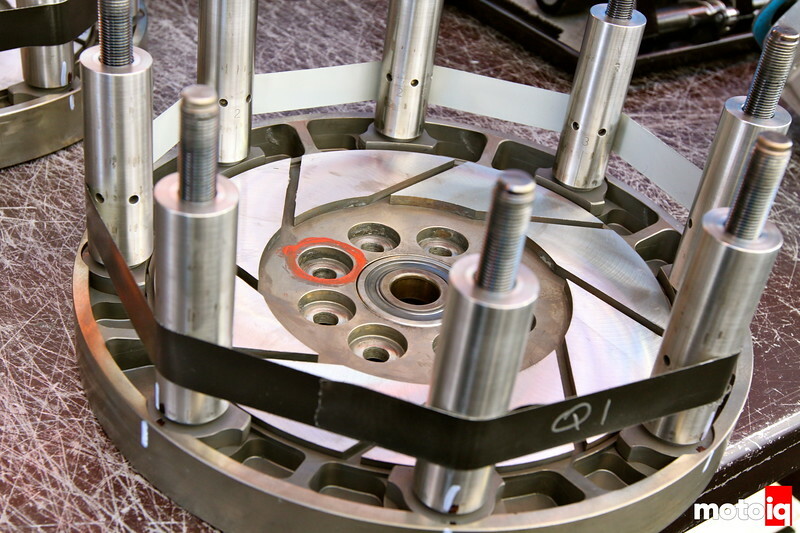 Here is the flywheel, which is built in-house at DSR. Check out the size of that hardware!